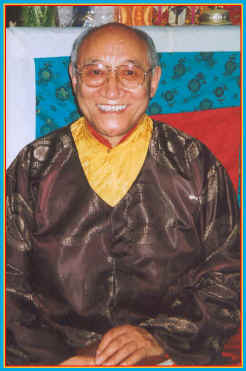 Ato Rinpoche (b.1933) is a most generous and refined teacher who is fluent in Tibetan and English. Rinpoche is regarded as a realized master of both Mahamudra and Maha Ati. Recognised by the 11th Tai Situ as the eighth incarnation of the Tenzin Tulkus, he is fully trained in the teachings and practices of both the Kagyu and Nyingma. After leaving Tibet for India in 1959, the Dalai Lama placed him in charge of a monastery housing teachers of all four lineages. In 1976 he married and moved to Cambridge, England where he lives with his wife and daughter. He worked as a nurse at Fulbourn Psychiatric Hospital, Cambridge, until his retirement in 1981. Many students were drawn to Rinpoche's accessible style of teaching and great warmth when he visited Rigpe Dorje Centre in Montreal in 1999 and 2002. We are grateful to be a regular part of Rinpoche's North American itinerary. On Fri. at 7:30 pm, Refuge was offered followed by the Chenrezig empowerment. On Sat. and Sun., from 10 am-noon and from 2 to 4 pm, Rinpoche spoke on "Daily Behaviour in Buddhist Life" with reference to Patrul Rinpoche's Words of My Perfect Teacher, and the Songs of Milarepa. I was only present in the afternoons, when Rinpoche used his own experiences to enlarge upon the Buddha's fundamental teachings and also, the Songs of Milarepa, the writings of Dusum Kyenpa, and events in the life of the 16th Karmapa. The locale, a former school, in the dead-end of St. Roch Street was not easy to get to for anyone unfamiliar with the area. The main entrance is concealed on the west side of the building, and there were several south Asian cultural events in progress which contributed to a sense of uncertainty regarding the address. There were a few small posters taped here and there on the doors of the building to indicate the way to the meeting but they seem to have petered out at a crucial last stage in the labyrinth. Finally, a stream of shoes outside the door of what may have been a former gymnasium in the bowels of the place confirmed the destination. Only half the vast space was used for the meeting that was hosted by Rigpe Dorje in concert with Shambhala International, to judge by some of the banners. These were cleverly hung from the suspended ceiling to demarcate and decorate the space, and lend an appropriate ambience. Behind some portable screens, several tables held a truly extensive stock of dharma books in both French and English that were available for purchase. There were about 60 people there on Saturday afternoon, and some fewer on Sunday -- a good number for the occasion. About a third were seated on cushions with the rest in typical waiting room armchairs. I arrived a bit late and took a seat at the limits of the range of the amplification system, so I can only give a few highlights. We are fortunate, here in bilingual Montreal, to often get a second shot at words we might otherwise have missed. When the translation is by the generous and meticulously competent Mme. Esther Rochon, we also benefit from her clear articulation and fine vocal timbre. Rinpoche was relating how his karma combined with the impermanent nature of samsara to contribute to his life full of changes and transitions that confirmed what his teachers had always emphasized: "Everything is impermanent." To have found himself a British citizen living in Cambridge, having spent 12 and a half years working in a psychiatric institution as a nurse, was about as far as one could get, given the nature of his birth in 1933 in Kham (east Tibet.) Though he had been recognized as an incarnate lama, he had had to flee his country to live in India for seven years. Though he was a celibate monk in charge of Nezang monastery, his life's path led him to became a married, family man. He emphasized that anyone who has ever considered suicide ought to learn a lesson from that, since all situations are certainly transitory -- not only the good ones -- the bad ones, too. He stressed that factors like one's karma or the meeting with fine teachers cannot alone lead to nirvana. Enlightenment requires lots of work on the Middle Path and the eight "Rights," particularly Right Livelihood. Whatever we choose to do, we ought to examine our motivation for doing so. Rinpoche emphasized the importance of Mindfulness while eating, sleeping and performing all the other functions. He also emphasized non-attachment even to habits or kinds of Buddhist practice. Some techniques -- for example, using the breath to help in concentration while meditating -- are not to be relied upon forever. "Children outgrow things as they go through various stages of maturity." We might need different kinds of practice at different times in our lives. We should not invest too much in any of them; nor should we doubt too much. He spoke of the importance of meditation and of its fruits: Dusum Khyenpa (Knower of the Three Times,) the original Karmapa, was so-called because of his perception which he had perfected via meditation: 1. He could see the past clearly 2. He could see the future clearly 3. His normal perception was also perfectly clear. In fact, he was the first one to predict his future rebirth which he only did on purpose, in order to demonstrate the benefits and efficacy of meditation. It was for that reason that certain lamas of the other Schools [besides the Kagyupa] emulated the practice of intentional rebirth, "They said, 'That's a good idea!' "
"Remind yourself three times, four, or even only once a day, YOU are in control of yourself." Q 1. If two lamas have given "pointing out instructions" to me, which is my guru? A. Rinpoche laughed, recalling for us the signs in the London Underground [subway] that, in the interests of safety, exhort us to "Mind the gap." He told us of his life as a young man working for hours in the hot sun of India. There were times that he was dying for water so that at a tiny spring, he tried catching one drop at a time and then licking it off his palm. That just seemed to make him even thirstier, of course. He had to discipline himself to put down a container and wait for it to fill in order to slake his thirst. In any situation, try not to lose your concentration, but you could take advantage of any gaps in the activity for the purpose of meditation. Q 3. Do we have to do mantras in Sanskrit? A. Yes, mantras ARE Sanskrit. Even Marpa Lotsawa and Thonmi Sambhota did not attempt to translate them. Q 4. But what about the many different words for things such as vajra and bezar, and pema instead of padme, and the like? A. It may seem that these are translations but they are not. They are only Tibetan faulty pronunciations of Sanskrit -- like my pidgin English. Q 5. What are some guidelines for observing Right Speech? A. Do not cause hurt; don't swear and use rude words. If you make a mistake, resolve not to do it again. Also, being truthful has lots of benefit -- it is an important aspect of moral conduct. And "regular people" notice if you tell the truth. Q. 6 How do we meditate when we are in pain and suffering? A. The key is to practice before these situations arise so that we are prepared when they do. Do not procrastinate. It's like when you know you are going to take a trip; you get your bags packed beforehand. The interval of preparation is the chonyi bardo [Rinpoche pronounces this, 'pardo'] If you know the p'howa prayers, you will be able to help when someone is dying, otherwise ... .
Did you see the film The Lion's Roar about the passing of the 16th Karmapa? When he was in India, doctors found that his body was riddled with cancer, so his American disciples pleaded with him to go to the US where they thought there would be better medical treatment. When the Karmapa was taken to a hospital in Chicago, they confirmed what the Indian doctors had found, and they could do nothing for him but prescribe some medication for the severe and constant pain they were certain he was experiencing. His stay, however, seemed to turn into a kind of comedy routine. The doctors would ask him every morning whether he needed pain medication, and he would reply, "There is no pain." Q 7. What should we do for sickness and pain? A. There are healing practices and mantras such as Medicine Buddha sadhana and also, the Vajrasattva mantra is good. The efficacy of these things depend upon devotion, of course, as in the story of the Dog's Tooth. The practices of Amitabha and Chenrezi are also helpful. Q. 8. What do you think will happen to this world? Q 9. Can you see the future? A. Not yet. I have faith and devotion and do prayers, but not yet ... .
Q 10. When someone is reported to be able to see the future, does that mean that the future is already determined? At one point the lama reminded us that Buddha Shakyamuni had said that it would not be his enemies that destroyed his teachings but rather, that his followers if they were not careful, would distort them. Rinpoche pointed out that the determination of future rebirths or tulku was initiated by Dusum Khyenpa, the first Karmapa, in order to demonstrate the efficacy of meditation and not for any other reason. Q 11. How should we die, ie. what should we do while dying? There are books such as that by the Jamgon Kongtrul that say we should lie in the position assumed by the Buddha at his parinirvana -- lying on our right side, etc. A. We are in the practice-living bardo. But you know, if you try to do these things in a place where these practices are unknown, they will say, "Poor man, he is restless" and they will turn your body to place you again on your back. [Much laughter.] In my country, a dying man will try to stay sitting up in meditation position. For where there is knowledge, there is the means for practice. There, people will place a cushion behind his back so that he can maintain the correct posture. But no one can ever know what is in your mind [unless you let them know.] If there is snoring, then we can guess the person is sleeping, otherwise how can we know? Q 12 If time is limited, what is the most important practice? A. Amount of time and so on, I am not giving you -- Do what is beneficial. Do what you enjoy and what is familiar to you -- go by your own feelings. One thing you can do is keep a religious book by you and just open it anywhere at all and determine to read a page or two at a time. [Rinpoche uses The 100,000 Songs of Milarepa as an example.] Remember the drops of water. You can use a book of the life of one of the Karmapas. Don't force. Do short prayers and do more repetitions of them. And do them regularly. Support the dharma by giving. Then, if you know meditation, hold mind-awareness. Q. 11 How did you live with that decision to marry when you were an abbot and a tulku monk? A. My uncle and the Karmapa were disappointed. It is a long story, but I just decided, it was not only karma. It was sad, for only one only monk remained as a caretaker and he cried for three days. All the people of the area were quite upset. It was not like under Mao and the Cultural Revolution where they held a gun to your head to try and get you to change. "Even if Mao shoots me I no change." It was not an easy decision and my wife is of a different religion than I am. We care for each other and respect each other's religion and we share. I spent 7 years in India to adapt and then there was change again in Britain. "So far, so good; I'm still here." And I am still married -- so far, so good -- as the saying goes, "until death ... ."
Q 12. How do we get to live in our own way which may be different from that of our parents and others? A. We must try not to harm others, but people do have expectations. "Work on it." It requires lots of practice. And remember, that even if we know how to drive a car and we do it carefully, we can still have an accident. "Samsara is not easy." Sometimes, if we are too careful, we can have an accident, too. Be patient. There is much balancing involved: practice the 6 paramitas, then the 10 paramitas and so on, bit by bit. Remember, it is easy to see others, but less easy to see ourselves. A. That question requires more than the time we have here. It comes down to "Where is Mind"? Some Buddhist views hold that the "mind" is actually located in the heart, but we know the heart is only a pump. It is all a manifestation of Mind. Catholics especially it seems, ask, "We have God; what do you have?" I say, "We have the Void." "What is the Void?" they ask. "What is God? Is it an old man, a young man? " It's great fun! Ato Rinpoche does not stand on ceremony. He likes to shake hands with people instead of waiting for them to prostrate or bow. This informality was also evident in the manner in which the teaching was terminated with the customary remarks that the responsibility for any errors was certainly his and not that of his teachers. This was done in an entirely conversational way; not at all ceremonial yet with sincerity. In response to requests, Ato Rinpoche concluded by giving reading transmissions (lung) for the Guru Rinpoche 7-branch Prayer and for Green Tara. Ven. Ato Rinpoche spoke on Dharma in Everyday Life at Centre Castelnau, invited by Shambhala & Rigpe Dorje (Montreal, Qc., Canada.). 1a. regarding homosexuality: As far as he is concerned we are all animals caught in samsara, and there is no use in feeling guilty due to that very fact, but one might consult the Dalai Lama on the subject. 1b. on the apparent subordinate position of women in Buddhism: Although he declined to comment on the history of the early sangha, he said there is no difference in the status of men and women since, "Who knows where there is a bodhisattva?" He gave several examples of noted women teachers such as Ven. Khandro Rinpoche, the Jetsunma of Mindroling, and the Sakyapa teacher (Jetsunma Kusho Chimey Luding or Ven. Jamyang Sakya teaching in Seattle,) among others. He also told us of the nun whose main practice was nyungné (1000-armed Chenrezi austerity retreat.) She lived at the time of Jamgon Kongtrul II and had emerged from her seclusion only to ask H. E. for a teaching, but when he addressed her, she replied in her habitual fashion, as she had been doing for years: Om mani pémé hum. 2. What is one's obligation after having attending an empowerment? (See Empowerment). He told students to practice the sadhana for a week to give it a chance, though other teachers may advise from 3 days to 1 month. He reminded us that he had attended numerous initiations in his time and that he certainly would never have had enough time to do them all. When the questioner said that she had never heard a teacher mention this, Ato Rinpoche joked that now he would certainly make a point of mentioning it after the Amitabha empowerment, but that if he forgot, she should be sure remind him! 3. How does one deal with doubt? With doubt and our teachers help we make progress: "Learning from my doubts (and from my mistakes), I certainly learned a lot!" 4. Choosing one's teacher: Rinpoche said that one needs a special guru; but I have been in the presence of many wonderful teachers, how do I know which teacher is special? "Yes, there are many but one will stand out. One in particular will benefit you. It is like going to the supermarket where there are many delicious things. One food can still be your favourite." "Think in terms of recycling. We recycle paper and bottles; why not people?" The Karmapa was the first to notice this, Rinpoche said. 5b. Lama, do you remember past lives? "There are times that I go to get something but when I get across the room I don't remember what I went for. Do you think I can remember a past existence? ...You can see that I accept my age!" Rinpoche advised the person to keep the door open, so as not to shut out the other member(s) of the household but to veil images used in tantric practices. Should I explain? "No, it will not work." In such a situation, share the Buddha's life story or general teachings, but only if asked. The best approach with those who have so-called wrong views is "... to care, to share and to be especially kind." 7. Did I understand that you said that anger is OK? "No. Anger is not all right. Its use depends upon the qualities that accompany it. For example, a parent may be cross with a child when the motivation is to protect or help ... never when it derives from attachment to the self." 8. How is it possible to see an enemy as a teacher, as you had said? "Jesus worked on that his whole life. Talking about it does not make it any easier. We need to be patient with ourselves first. It is not easy. It is as if we have two sides: black and white and keep flipping form one to the other. But when you attain nirvana ... no problem!" 9. What about those people that know how to "push our buttons"? Rinpoche, then, asked "Do you have a family? Be patient with your family!" Ven. Ato Rinpoche concluded with the story of the yogi who was watching a family with a dog having a picnic. He saw that the chicken they were eating had once been the father who had kicked a dog trying to get at his meat. That dog was now the mother, and the child they were feeding together had formerly been an enemy. Such is the nature of samsara! At Rinpoche's request, the teaching ended with the singing of Calling the Lama From Afar led by Lama Chokey Gyaltsen whose beautiful, resonant baritone voice was especially strong and clear. Ato Rinpoche said that there was no need for any other practice than the study and chanting of that very moving hymn. Venerable Ato Rinpoche is the eighth incarnation of the Tenzin Tülku, and holds teachings and practices of both Kagyü and Nyingma lineages. He is a householder and father of a daughter. He is a dignified white-haired older man in the British style with a fluent command of English. He has a warm, relaxed way of expressing himself, not hesitating to ask questions in order to lead the student. It has been said that he bears a certain physical resemblance to Ven. Dilgo Kyentse. Dignified in manner and appearance, he wore gold-rimmed glasses and was dressed in a conservative version of traditional Tibetan lama's 3-garment garb. Over a golden-yellow shirt he wore a single-breasted jacket of Savile Row tailoring above the long skirt which covered tailored Western trousers. The fine woolen cloth was in a shade of wine that closely approached a dark purplish- brown. He appeared businesslike and smart-looking as he taught sitting in an ornate chair, his shined leather shoes planted firmly on the floor; his dark mala with silver counter held between his hands on his lap.